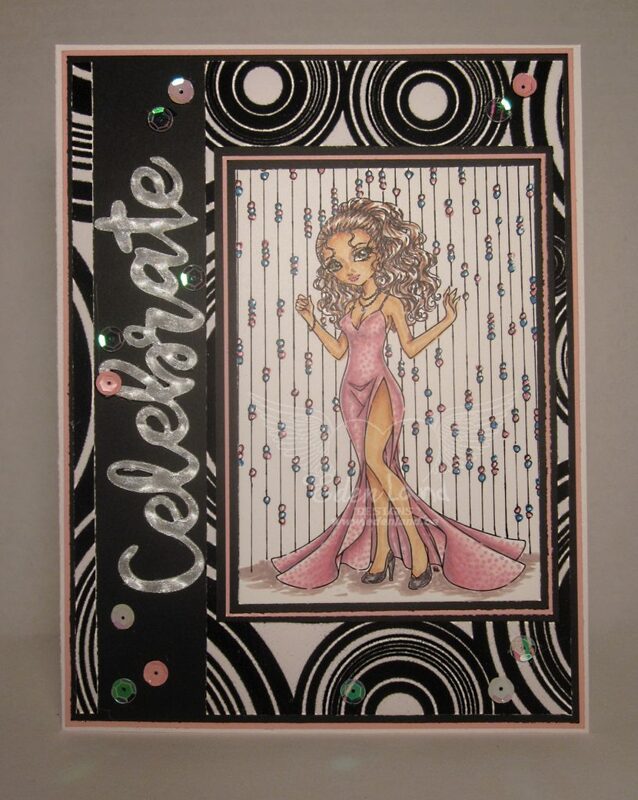 Hello again 🙂 I’ve been busy coloring and making cards this last week, and now I’m blogging like mad :/ I finally got around to coloring one of the beauties from Make It Crafty, something that has been on my need to do list for way too long!! This lovely lady is Matilda Celebrates. 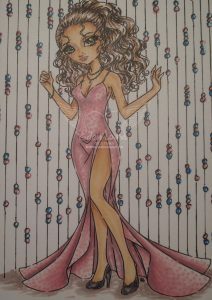 I colored her with my Copic and SN markers, adding dots to her dress with the mid-tone color, and some beaded curtains in the background with a black fine liner. When I set to making up the card, I wanted to keep the image in focus, and keep the whole look festive, yet elegant. Good thing I have thousands of sheets of DP to choose from, lol! I found the funky black and white circular patterned paper….the black parts are a fuzzy velvety texture. I die cut the word “celebrate” out of a holographic piece of plastic with a die that I got quite some time ago, and have forgotten where from!! The plastic was quite heavy and really put my poor Cuttlebug to work!! After getting everything glued down, it still needed a “bit” more, so I added some iridescent and pink sequins for the final touch. Wow, this is stunning so beautifully coloured and I love the beaded curtain. Thanks for joining us at Make it Crafty’s add details to an image challenge. Fantastic card. So elegant! Love the beaded curtain.